Looking for something to do with those leftover hardboiled eggs you have laying around after Easter? 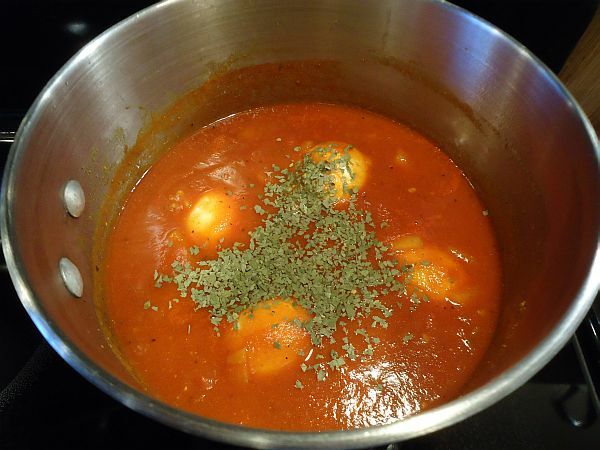 Try this awesome South Indian recipe I stumbled across–it only requires an onion, a tomato, a can of tomato sauce, some garlic, and a variety of pretty standard Indian spices. It’s called Egg Kulambu, and it filled my kitchen with the most delightful smells as it simmered away on the stove. I used roughly twice as much tomato sauce as the recipe called for (and reduced the amount of water accordingly) because I didn’t want half a can of tomato sauce sitting around. I actually like the way it made the sauce a bit thicker. This dish would be excellent served over rice or with some naan, although I actually ended up eating it like soup with some toast on the side. Be forewarned – this dish does pack a powerful punch, so if you’re sensitive to spicy foods, you may want to cut back on the cayenne a bit. But if you, like me, have been searching for a South Indian recipe that doesn’t hold back on the spices, go for it! But you may want to have a glass of milk handy, just in case. P.S. A note about hard boiling eggs: I usually use this method from Simply Recipes, and I’ve never overcooked my eggs with it. But I still spend the whole time standing over the pot, worrying if they’re going to come out right. If anyone has any foolproof tips, leave them in the comments! I’m still working on getting the rest of the Portland posts put together, but in the meantime, here’s a guest post from my mom who wanted to share her Orzo Caponata recipe with you all. Enjoy! I am always looking for recipes which incorporate fresh veggies from the garden or which are seasonally available at the market. Substitutions in a dish like this are easy, and if you don’t have some of the items in your pantry, just try substituting something similar. Any shape of pasta will work, and once the pasta is boiled (which can be done in advance) this is a one-pan-meal. I like to cut up all my veggies first, and lay out the pantry ingredients on a dinner plate so it is easy to add them into the pan in good order. Boil a large pot of water, add salt and 2 – 3 cups of organic orzo pasta. Cook until just tender. I like to boil a big batch and use some for this dish and the rest for soup or a pasta salad the next day. Drain, drizzle with a bit of olive oil, stir and set aside. Wash and prepare vegetables. I use organic and home-grown ingredients. If you use eggplant from a store, you may wish to salt the slices and let them sit to draw out any bitter liquid. Rinse and pat dry before using. In large deep skillet, heat approximately 2 Tbsp. olive oil. Add onions and celery and sauté until translucent. Add more olive oil if needed, then add green pepper and eggplant. Saute over medium heat until vegetables are tender-crisp. Reduce heat slightly. Add raisins, olives, and capers. Stir a few times. Add herbs, black pepper and pine nuts (if you wish). Stir until all ingredients are hot. Add tomatoes and red wine vinegar to taste. Stir. Add 2 cups or desired amount of cooked orzo. Stir. Grate cheese in to taste. Stir and cook over low heat until cheese melts and flavors meld. Add sea salt to taste. Serve warm. Can be eaten the next day over fresh greens as a salad.